I am a Master of Science candidate finishing up my first year at Wilfrid Laurier University. As with most members under the supervision of Professor Philip Marsh, my study focus is related to snow hydrology. 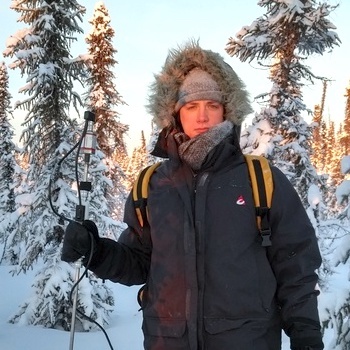 My research interests are in new snow measurement techniques, which goes hand in hand with my thesis topic where I am working with different types of cosmic ray sensors in order to accurately measure snow water equivalent. This research has considerable potential to assist snow water equivalent measurements because current measurement methods are almost exclusively set in either point-scale or very large-scale approaches, while the cosmic ray sensors are able to measure snow at an intermediate scale. Other advantages these sensors have in comparison to conventional methods is that they are easy to install and transport, they are terrain independent, and have an extremely low environmental impact. These sensors are able to measure cosmic rays, which have a galactic or solar origin. As these cosmic rays enter the earth’s upper atmosphere, they interact with nuclei and cause a cascade of secondary cosmic rays in the form of high-energy (fast) neutrons. It is these fast neutrons that the cosmic ray sensors are able to record. Before the data from these sensors can be used, it must be calibrated for air pressure, atmospheric water vapour, and the incoming temporal cosmic ray flux that occurs naturally throughout the day. Afterwards, this data must be scaled to adjust for the latitude, longitude, and elevation. Following this, the data must account for statistical noise that the cosmic ray sensors inherently detect. As one may expect, it gets considerably more complex. Overall, it is my thesis topic to prove that these sensors do (or do not) work. While results are still preliminary, a relationship appears to exist. On a more personal note, I spent my formative years in Siberia – the coldest place in the northern hemisphere where people actively reside – and love cold environments, especially in remote or semi-remote regions. I have been to Trail Valley Creek three times now, in the summer, winter and spring, for a total of almost 50 days in the Trail Valley Creek Research Station and about 10 days in the town of Inuvik. Over the next year, I will be making several more trips to Trail Valley to continue conducting snow surveys in order to validate the cosmic ray sensor data I am working with. Anton defended his Master of Science thesis in November 2018.